I was dreaming about it." If a man can take many years to come to a conclusion that any right minded, sane individual would come to in seconds, then we are dealing with a man of a very different calibre, one an age away from modern twenty-first century thought, one with the morality of a profoundly enforced delusion. He was told and retold again and again that he had ascendancy over others by right of birth and circumstance. In the darkest years of WWII, this man was legion and it was called the Nazi Party. Its charismatic leader (apologies if that sounds like praise) whipped a nation up into a frenzy of hatred and his loyal soldiers presided over the delusion of superiority with a breathtaking, echoing abyss, a yawning void where conscience used to be. There were grand weekends attended by the Nazi upper echelon where the fate of millions was sealed by boardroom euphemism. The Jewish 'problem', the 'final solution', 'special treatment'... So many words for two simple ones – 'kill Jews' and a few more deemed accepted as read; "...and don't stop until they've been wiped out." It's been often said that a person has to convince themselves of the sub-humanity of a race of people in order to subjugate them and eventually slaughter them like animals. Remorse for these people is for jail-time – either that or the seconds' thrashing beneath a tightening noose. Sobibor was one of many camps, located in the east of Poland, far from prying eyes. These were concentration camps that specialized in the covert extermination of human beings. Of course, no human being walks willingly to their death so certain 'niceties' were observed to ease the victims' passage. Viennese waltzes, scratched out over loudspeakers, accompanied the disembarkation of Jewish refugees. They were all informed that they were in the camp to work and as we all know from the infamous inscription wrought in iron in the Auschwitz front arch, "Arbeit Mach Frei" – "Work will set you free..." The prisoners were told that they would have showers – nothing out of the ordinary. The Nazis had one advantage in the subjugation of the Jewish prisoners. Their 'final solution' was beyond inhuman and human comprehension and only the most deeply cynical or wearily experienced could guess what horrors their captors were plastering with platitudes. In this environment, the Nazi SS needed help running the camp. Apart from the watchtowers overlooking the entire barbed wire enclosures, a submachine gun trained on any escapee, the guards ran the whole egregious show with Jewish aids. Named 'Kapos', some relished the sliver of power and the apparent immunity from extinction and wielded the whip without mercy or empathy with the promise of better food on their minds. Others gritted their teeth through consciences tortured on a daily basis and put on a show for their captors, whips in hand but lightly applied. Those arriving prisoners with skills that disembarked the daily trains were spared 'the showers' and the rest were led away, waving to their spouses or children with no rational inkling of what lay around the corner. It is in this grim setting that Escape From Sobibor is set. Leon, played by the under rated and criminally under used Alan Arkin ("Help the bombadier! "), is a Jewish prisoner who helps to run the camp. In his own words, "...every day will be an agony of conscience." He is powerless to stop the atrocities at his doorstep and hot headed dissenters only have one future and it's as short as the time between the hammer falling and the impact of the bullet. Each helper travels, to re-use a rather apt metaphor, along the edge of a straight razor. Arkin has in mind a will to live and even to escape but it's not until another individual's arrival does that future suggest itself. Until Rutger Hauer joins the movie (a full hour and twelve minutes in), we are left to witness the appalling brutality and state sponsored atrocities that defined Nazism. I see no reason to remark upon the almost mundane horrors visited upon these people. A list would be pointless and emphasis on any one would skew the overall crushing awfulness it must have been simply getting up every morning. But I have to mention the baby if only because even the hardest flint of heart has to perceive an infant barely weeks old as a creature guilty of nothing except a helpless need. This is where the real horror takes root. Sara Sugarman (last seen by myself suffering again in an episode of the rather wonderful A Very Peculiar Practice) has managed to smuggle a child into where she works as a seamstress. As the baby wails during an inspection (as it inevitably must), her maternal instinct clouds her logic (whose couldn't?) and she stands up to her oppressors and spits in defiance. It's enough for both mother and child to pay the ultimate price of rebellion. On the more positive side, one of the first arrivals is Polish actress Joanna Pakula on whom I had an enormous crush after seeing her in Gorky Park. She has that strikingly haunted angularity that makes her ideal for the role of Luka (her Polish descent I'd like to think was a happy accident). Let's not forget that her exquisite face also turns quite a few heads. In the same batch of prisoners is Jack Shepherd whose family he waves off as they head for the 'showers'. It's not until many days later when Arkin gently informs him of the truth does Shepherd break down in an utterly convincing rendition of disbelieving grief. As Slarek has mentioned, one of the odd positions the audience are in is that of all knowing viewer. We know. They don't. It's dramatic irony on a grand, almost Grand Guignol, scale. 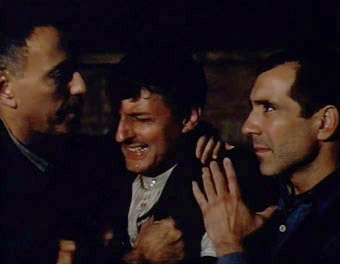 Arkin attempts to calm down a fellow prisoner after his brother has witnessed a line of naked prisoners, queuing for death. It's a brave piece of literalism for any film, let alone a twenty-year old film made for TV. A naked boy breaks the line and runs, frightened for his life and in one of the most horrific 'let's leave this to the audience's imagination' scenes I have ever witnessed, an Alsatian guard dog, all teeth gnashing, is loosed upon him. It's the boy's nakedness that somehow ups the ante in this scene. I can't tell you what a mind's eye kicks up with no revealed blood and guts to staunch the flights of imagination. But then what a directorial sleight of hand – bring home the horror by showing (or not) an associated horror tangential to the main event, those shuffling naked lines, most of whom have to believe they are waiting for soap and water... Awful and shocking. The smoke stack belching out its human remains punctuates the movie with eerie and perfect timing. If you're aware, it's in a great many scenes reminding you in the background, smoke black as night. 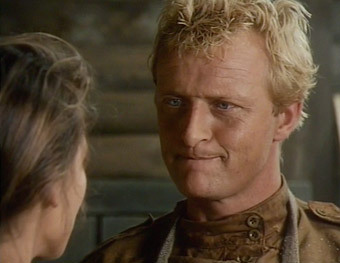 Five years after delivering Roy Batty's "time to die," line in Blade Runner, Rutger Hauer turns up as Sacha, a Russian soldier newly imprisoned in Sobibor. He's the catalyst for an escape attempt and after all the options are exhausted, Arkin comes up with an idea that at the time of viewing I deemed ridiculous but they almost, almost got away with it. I won't spoil what has to be done for their plan to have a shot at working but I will say it's a real nail-biter and credit goes to director Gold for reigning in the salacious and gratuitous elements that must seem so tempting to story-tellers. Hauer has the most amazing physicality. He's a big man but his face registers subtle vulnerability with a deceptive ease. He's utterly convincing as the man of action and it was nice to note that the real man upon whom Hauer's character was based was still alive at the time of the movie's release (at the grand age of seventy seven). Hauer garnered a Golden Globe for Best Supporting Actor for his work in this movie – well deserved. "There are those here who wonder if we can forgive God..."
A TV movie made in 1987? Could it be anything but 4:3? But Jack Gold, a TV veteran knew exactly what he was doing and makes the framing count despite what feels like an aspect ratio from the middle ages. The 35mm source material has not been revisited, as far as I can tell. The picture quality, though perfectly serviceable, is well below what well and newly scanned 35mm can offer. I was surprised to find out that the movie was originated on 35mm. It feels 16mm-ish (it's technically a British production), is dotted with very few dust spots and was mastered from a tape I suspect. A pity. But then a 2K scan of 35mm is expensive... A 4K scan... Heaven. The mono sound is faithfully reproduced via a Dolby Digital encode. The Holocaust is a powerful subject and each film associated with it takes on that gravitas as baggage for dramatic good or ill. The lesser movies do not dent the historical record but the good ones are measurably heightened by its spine of awful truth. 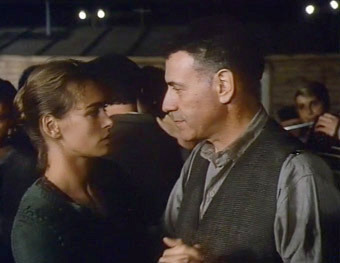 Escape From Sobibor is an excellent TV movie which, given a few scenic enhancements, could be an honest to goodness theatrical motion picture. As TV, in 1987, it must have made quite a splash because it still stands up as an horrific snapshot, an excellent and harrowing example of how our species went to hell and how, extraordinarily, some managed to crawl out. Highly recommended.